The story of one of the greatest Formula One racing drivers is captured in an exhilarating documentary. Senna is as exciting and engaging as the most dramatic motor race, British director Asif Kapdia succeeding in finding the deep humanity within a sport where hardware can easily dominate. Starting with Senna's 1981 arrival in Europe to race in go-karts and ending with his funeral in 1994, the film remarkably has no talking heads and no on-camera retrospective interviews: the story is told through actual footage of the man, his races, and the interviews he himself gave throughout his career. The result is emotionally charged, a compact summary of an extraordinary talent as seen through the live cameras of the day. Senna started his F1 career in 1984 with the Toleman team, which was so technologically deficient that it was expected to finish several laps behind the leading cars in every race. Instead, Senna was immediately and unbelievably challenging for race wins, demonstrating remarkable skill and wringing more performance out of the Toleman than practically possible. He quickly progressed to the storied Lotus team, winning his first race at the 1985 Portuguese Grand Prix, finishing more than a minute ahead of second place in torrential race conditions. But it was with the then-dominant McLaren team, starting in 1988, that Senna finally had the equipment to match his talent, and he blossomed into a World Champion, battling fiercely with team-mate Alain Prost and winning the title in 1988, 1990 and 1991. The Senna / Prost battles are now legendary in F1 folklore, and included two probably intentional collisions in the 1989 and 1990 Japanese races. Senna also appeared to take on the entire F1 establishment during this period, due to the perceived bias of the king-makers towards the more politically astute Prost. The Williams team finally caught up and surpassed McLaren. Senna found himself with inferior equipment in 1992 and 1993, but kept battling for race wins. He joined Willliams in 1994 and was a strong favourite to reclaim his world champion title, but met an untimely and tragic death at the cursed 1994 Imola Grand Prix, when a possible steering column failure sent him into the wall at the Tamburello curve. Senna was the second fatality and fourth serious crash that fateful F1 weekend in Italy. Senna captures the essence of the man: respecting God, proud of his country, humble about his talent but not in any doubt about his superiority. His emotional vulnerability in the face of danger is apparent: Senna was not the stone-faced warrior who dismissed adversity. He openly interacted with mortality, personally visiting the scene of serious crashes on race weekends and vocally seeking ways to improve track and race safety. Kapdia clearly understands the inherent power of Senna and the events of his life to speak for themselves. 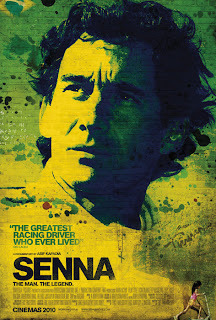 He avoids any melodrama, simplifies the structure of the film and focuses the documentary on selecting the most appropriate footage to construct the most streamlined yet rich recounting of the Senna story, never allowing the man himself, his thoughts and feelings from veering too far from the middle of the screen. The result is the equivalent of spending over 100 minutes co-living with Senna the highlights of his life, and the pain of his tragic death is naturally amplified. Senna the documentary is a privilege, an experience to be shared rather than a film to be watched.